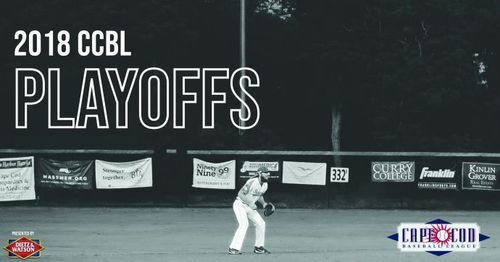 Brewster was looking to slow down the Anglers on Friday evening to force a game three in the East Division Semi-Final game. Chatham was on the board first after a ground-rule double from Blake Sabol was followed up by a single from Spencer Torkelson to take the 1-0 lead. After loading the bases on a single, walk, and hit by pitch, Ben Ramirez drove in John Rave from third on a sacrifice fly to double their lead in the fourth. The Anglers crossed one more in the eighth on a Kyle McCann single to right field scoring Rave one more time. Tristin English pitched an impressive eight and two-thirds innings for Chatham, surrendering just two runs in the ninth to Brewster on a Gage Workman homer to right field. Kyle Hurt was able to come in and get the last out to send Chatham to the Championship round to play the Wareham Gatemen. The championships start Saturday at 6:30 in Wareham. The Anglers and Gatemen starting pitchers are to be determined. Wareham moves on to the Championship Series and will play the winner of the Brewster/Chatham series. Chatham travels to Brewster tomorrow at 4pm for the second game of the best two out of three series. Chatham leads the series 1-0. The Championship Series will begin Saturday or Sunday depending in the Brewster/Chatham series. Wareham will have home field advantage for the Championship Series. Chatham at Brewster was postponed yesterday, and they will play game two of their series today. Wareham continues to roll in the CCBL playoffs, advancing to the championship round. They await the winner of the Chatham/Brewster series to play for the title. In the first, Wareham’s Austin Shenton hit a solo homer to take the early 1-0 lead. After a scoreless few innings, Wareham struck again in the fifth beginning with a two-run triple from Isaac Collins. Jakob Goldfarb singled to right field to score Collins, then a Drew Millas single drove in Goldfarb. Shenton crossed the plate on a wild pitch to cap the five run fifth. Falmouth was then able to get on the board in the bottom of the inning with two runs coming on a groundout that scored Logan Davidson and an error that allowed Herbert Iser come across to score. In the sixth, Gatemen Jeremy Ydens hit a sacrifice fly to left to score one last run to increase the lead to five. But, the Commodores scored two runs on a dropped third strike that scored Cameron Cannon, then a sacrifice fly from Iser scored Matt Wallner. The Gatemen handled the Commodores for the rest of the game, shutting them out the final three innings to lock their position in the championship game. Best 2 out of 3 series continues August 9th winner of this series goes to the Championship series. Chatham at Brewster 4pm Postponed due to field conditions and will be played tomorrow at 4pm in Brewster. Wareham was able to grind out a win against Falmouth on Wednesday night to take a 1-0 lead in the semi-final round in the West division. The Commodores were up early with a two-run triple in the third from Maverick Handley. The Gatemen were able to tie it up at 2-2 in the fifth on a solo shot from Ryan Kreidler, then later an RBI single from Austin Shenton. In the seventh, Wareham struck for two more on an RBI single from Skyler Hunter, scoring on the next at bat when Isaac Collins hit a triple. Falmouth was able to get one in the eighth on a Matt Wallner single, but Wareham was able to hold off the Commodores to take the first game of the series. It was a high scoring affair in Chatham, and the Anglers were able to pull out the victory over Brewster in game one of the East division semi-finals. Chatham put up a run from a Michael Busch RBI single in the first and four more runs in the second on a groundout that brought Greg Jones in to score, then a three-run homer from Spencer Torkelson later in the inning to take a 5-0 lead. Brewster got on the board with a Jesse Franklin solo homer in the fourth, then another solo shot from Ray Alejo in the fifth. Torkelson responded with his own solo homer in the bottom of the fifth to keep the four run lead. In the sixth, John Rave joined the solo home run trend, followed by a four-run seventh for Chatham thanks to a Blake Sabol solo homer, a Colin Simpson two-run shot, and a Rave double that scored one. Seeming to be easy sailing for Chatham for the rest of the game up 11-2, the Whitecaps created their own four-run inning in the ninth thanks to a Christopher Wright solo home run, an RBI single to center from Johnny Tuccillo, and a two-run single from Justin Ammons. But, Brewster’s rally then ended, losing the first game. Divisional Finals begin Wednesday August 8th. With the Hyannis loss to Falmouth the Divisional Finals begin on Wednesday. These series will also be the best two out of three. Falmouth travels to Wareham for a 6:30 game and Brewster travels to Chatham for a 7pm game. Falmouth eliminated the Hyannis Harbor Hawks from the playoffs with a win on Tuesday night. In the second inning, Hayden Cantrelle singled to score two runs for the Commodores. The Hawks tied it up on a Davis Wendzel double that scored Eric Rivera and Mitch McIntyre. After three and a half innings of scoreless baseball, Commodore Cameron Cannon singled home Maverick Handley, allowing Falmouth to walk it off and advance into the next round. If Falmouth wins on August 7th ending that series, the next round games begin on Wednesday August 8th. If Hyannis wins and forces a third and deciding game on August 8th, the next round games will begin on Thursday, August 9th. Brewster Whitecaps at Chatham Anglers at 7 PM. Chatham Anglers at Brewster Whitecaps at 4 PM. Wareham Gatemen at Falmouth Commodores/Hyannis Harbor Hawks winner at 6 PM. Brewster Whitecaps at Chatham Anglers at 7 PM, if necessary. Falmouth Commodores/Hyannis Harbor Hawks winner at Wareham Gatemen at 6:30 PM, if necessary. Wareham won the second game of the series in style to advance to the next round of the CCBL Playoffs. They jumped on Cotuit early, spotting three runs in the first inning with an RBI single from Drew Millas and a two-run single from Gian Martellini. Cotuit got one back after Michael Salvatore was able to cross on a wild pitch. Lael Lockhart Jr. added another run for the Gatemen with an RBI single, but Michael Toglia’s solo shot negated it for the Kettleers. In the fourth, Trey Jacobs blasted a three-run homer to take a 5-4 lead for Cotuit. The Gatemen tied it up after Austin Shenton homered. In the ninth, out of the blue, Wareham put up ten runs to put the game out of reach. Without the help of one error, the Gatemen scrapped together eight hits including four RBI singles, an RBI double, and an RBI triple. Jacobs was able to hit his second homer for Cotuit in the bottom of the ninth, but they still fell short nine runs of tying it up. The number one seed Y-D Red Sox were eliminated by the eight seed Brewster Whitecaps on Monday evening by a score of 12-2. Brewster was able to score in the first inning on a Conor Grammes RBI triple to take a 1-0 lead. In the third, Y-D used a sacrifice fly from Zach Zubia and a single from Nick Quintana to go take the 2-1 lead. The Whitecaps put up three runs in the seventh with two RBI singles from Ray Alejo and Grammes, followed up by Hunter Bishop scoring on a wild pitch. Brewster’s pitching did a great job to keep Y-D off the board and buy their offense time to put up runs, including eight runs that came in the eighth inning to put the game way out of reach. After being up 4-2 heading into the bottom of the eighth, five Brewster hits helped score eight runs and go up by ten on the Red Sox. The inning included four RBI singles and used a walk and wild pitch to score as well. Y-D could not answer, dropping their second game and being eliminated. It was a close game in Hyannis as the Commodores and Harbor Hawks finally played their first playoff game after they could not play the last few days due to weather and field conditions. Monday they were able to play, and it was a good one. In the second, Logan Davidson blasted a solo shot to take the early 1-0 lead. Fast forward to the sixth where Cameron Cannon hit a fly ball to left field, deep enough to score Maverick Handley from third to take that 2-0 lead. Todd Lott singled to center to score Matthew Barefoot in the seventh, but that is the only run the Hawks could bring home, and that would be the last run of the ball game. Both teams recorded just ten hits combined, six for Falmouth, four for Hyannis. Harwich had their back against the wall with a must win against the Anglers on Monday. They responded to the pressure with a five spot in the second inning thanks to RBI singles from Nate Eikhoff and Tanner Morris, a two-RBI double from Aaron Schunk, and Steven Passatempo taking home on a wild pitch. Chatham responded in the third and fourth, using an RBI single from Spencer Torkelson and another RBI single, scoring two, from Colin Simpson in the third, and a two-run single from Tristin English followed by a two-run double from Simpson in the fourth. This gave them a 7-5 lead heading into the fifth. Danny Casals singled to score a run for the Mariners in the sixth to bring them within one late in the game, but an error cost Harwich in the seventh, allowing a run to score. The Anglers were able to close it out and advance to the next round.